With 0% APR on balance transfers for 21 months (when made within the first four months) and purchases for 12 months, the Citi® Diamond Preferred® Card - 21 Month Balance Transfer OfferCiti® Diamond Preferred® Card - 21 Month Balance Transfer Offer is a market leader for innovative intro offers with one of the longest 0% intro APR offers we know of. 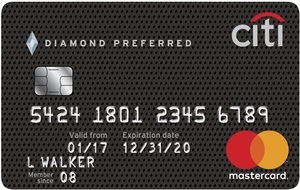 The Citi® Diamond Preferred® Card - 21 Month Balance Transfer OfferCiti® Diamond Preferred® Card - 21 Month Balance Transfer Offer credit card takes benefits to another level by continuing to spoil customers long after the 21 month balance transfer intro offer expires with VIP treatment: personalized concierge service, exclusive deals and access to pre-sale tickets for live events. (Citi® is a CardRatings.com advertiser). Excellent card for those who are looking to consolidate high interest credit card debt, with no annual fee. 0% intro APR for 21 months on balance transfers, which is among the longest 0% intro APRs we know of (12 months 0% APR on purchases). If you have a large purchase that will take a while to pay off, this is a clear winner for the task. This card isn't a rewards card. If you want a lengthy 0 percent offer AND rewards, you might consider the Capital One® Quicksilver® Cash Rewards Credit Card. Let’s start with the most obvious: You get 0% APR on balance transfers for 21 months and purchases for 12 months. The length of this introductory offer is simply unheard of. This card is all about VIP treatment, giving regular folk a taste of the exclusivity and benefits that the other half typically enjoys. One great card benefit is Citi’s® 24/7 personal concierge service, where a representative will do everything from book your hotel to make your restaurant reservations. Want to see Fleetwood Mac in concert or Martin Short do his schtick? Citi® Private Pass® extends the special treatment by allowing cardmembers to purchase pre-sale tickets and VIP packages to concerts and various live events. Price rewind is a feature of Citi consumer products. The feature searches for a lower price on the registered items you pay for in full with your Citi card, and if the same item is found online at a lower price within 60 days of your purchase, you may receive a refund of the price difference. You're covered for up to $500 per item, and up to $2,500 per year. If you think a credit card also should save you money, you’ll like Citi® Easy DealsSM. The program gives you access to gift cards, merchandise and more than 200,000 exclusive, members-only discounts at retailers like CVS and the Gap. It’s all about priorities when determining if this card is for you. If you’re looking for a low interest card for balance transfers and purchases, this is a great choice. If you’re looking for high-ongoing perks like cash back or airline miles, this isn’t the card for you. And though the 0% intro APR for 21 months on balance transfers is one of the longest on the market, don’t get blindsided by the APR after the intro offer. Depending on your creditworthiness the APR can shoot up significantly. See terms for the most current APR terms. Both cards offer lengthy 0% APRs for balance transfers and purchases, though Citi Simplicity® Card - No Late Fees Ever offers 12 months for purchases after account opening and 21 months on balance transfers from the date of first transfer, all transfers must be completed in the first 4 months (then, 16.24% - 26.24%* variable, based on creditworthiness). So, what really differentiates these two cards? Citi® Diamond Preferred® Card - 21 Month Balance Transfer OfferCiti® Diamond Preferred® Card - 21 Month Balance Transfer Offer is dedicated to ongoing concierge services whereas Citi Simplicity® Card - No Late Fees Ever has unique perks regarding payments: no late fees or penalty APR ever — a fairly unheard of concept. The choice between these two cards will boil down to this: which perks match your lifestyle better. The Blue Cash Everyday® Card from American Express shines with its point structure: get 3% back at U.S. supermarkets (up to $6,000 spent a year, then 1%), 2% at U.S. gas stations and select U.S. department stores and 1% back on all other purchases. The Citi® Diamond Preferred® credit card shines with its intro offer: 0% APR offer at 21 months vs. 15 months for the Blue Cash Everyday® Card from American Express (then 15.24% - 26.24% Variable for Blue Cash Everyday® Card from American Express). See Rates and Fees. The Blue Cash Everyday® Card from American Express, like Citi® Diamond Preferred®, doesn't charge an annual fee. It’s all about priorities: If you want a long 0% APR period go for Citi® Diamond Preferred®, if you want ongoing cash benefits go for Blue Cash Everyday® Card from American Express. Both these cards are powerhouses when compared side-by-side: No annual fees and long intro APRs for purchases and balance transfers, though the Citi® Diamond Preferred® does win out with its 21-month intro period as compared to 15 months with the Chase Freedom Unlimited® (then, 17.24% - 25.99% Variable for the Chase card). That said, if you can get by with the shorter intro period, what the Chase Freedom Unlimited® has over the Citi Diamond Preferred® is rewards-earning potential – specifically, new cardholders earn 3% cash back on up to $20,000 spent in the first year, then 1.5% cash back on all purchases. If you’re in it for the rewards, Chase Freedom Unlimited® is a better choice; if you need a long intro APR, go with the Citi® Diamond Preferred®. Citi® Diamond Preferred® Card - 21 Month Balance Transfer OfferCiti® Diamond Preferred® Card - 21 Month Balance Transfer Offer is perfect for someone with excellent credit who needs a card for everyday purchases without worrying about accumulating interest right away. With no annual fee and VIP treatment Citi® Diamond Preferred® Card - 21 Month Balance Transfer OfferCiti® Diamond Preferred® Card - 21 Month Balance Transfer Offer might offer enough to be a good trade-off for the lack of rewards.